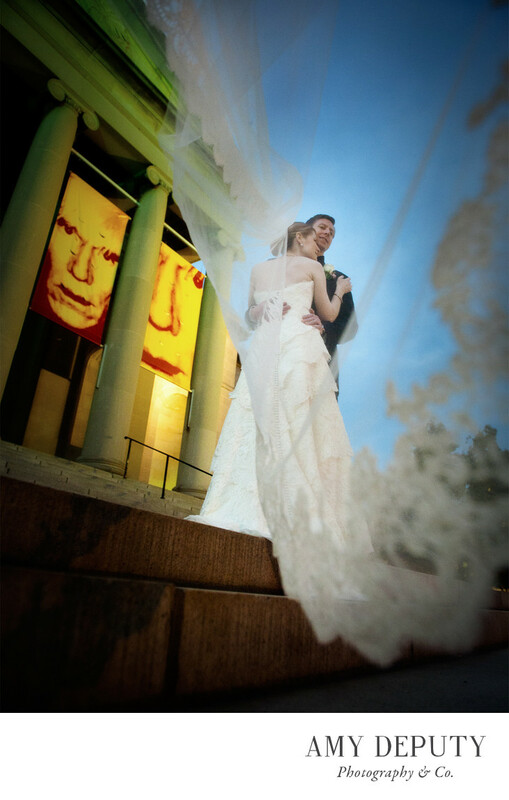 The newly-renovated Baltimore Museum of Art (BMA) is not just a perfect wedding venue for artists and art enthusiasts, though art lovers often make this top Baltimore wedding ceremony and reception venue a first choice. The museum’s varied rooms and spaces are ideal settings for a wide array of events. The grand, neoclassical Fox Court, just inside the museum’s front steps and historic entrance shown in the above photograph, is impressive and open with coffered ceilings and palatial columns. For outdoor gatherings, the Sculpture Garden provides a more modern and contemporary backdrop, with works by artists such as Auguste Rodin and Alexander Calder interspersed between blooming flowers and plants. From the lovely outdoor greenery to the artful surroundings, the BMA offers such a great variety of ideas for the very best in wedding photography. It is one of my favorite venues to shoot in and around, for weddings and any other event or occasion. Location: The Baltimore Museum of Art: 10 Art Museum Drive, Baltimore, MD 21218-3898.